A video of a Shake Shack customer praising one of the restaurant's cooks has gone viral on Twitter. 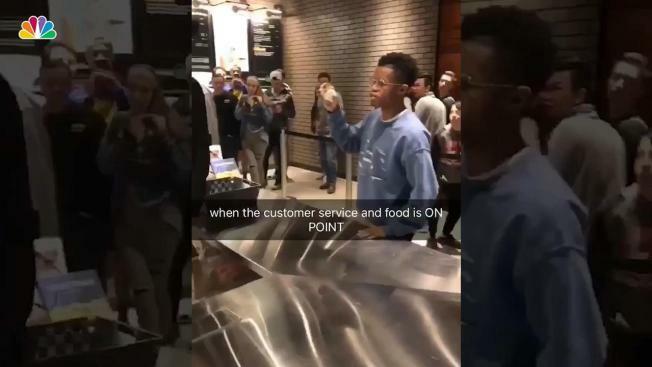 In the video posted Saturday on Twitter, Marcus Jeffers and his friends are seen eating at a Shake Shack in Marlton, New Jersey, when Jeffers suddenly gets up, walks up to the counter, and demands to know who made his burger. "Hey yo, who made this burger, man?" Jeffers yells across the restaurant. The restaurant falls silent as Jeffers repeats his question several more times. After some scrambling behind the counter, the chef is identified as Jason. "Jason, you killin’ it, man!" Jeffers exclaims, prompting surrounding employees and customers to cheer and clap for the burger chef. As of Tuesday afternoon, the video had been retweeted more than 190,000 times, and the Marlton Shake Shack kitchen team posted a response video introducing "The man, the myth, the legend, the Jason." The New York City-based fast food chain also appears to have enjoyed the video, responding with a tweet of their own.